At the Plano office of Dr. Scott Bunday, we offer all the general dentistry options your family needs to maintain excellent oral health and beautiful smiles. We can also attend to your restorative dentistry and cosmetic dentistry needs! At the Plano office of Dr. Bunday, we know our patients. We care about every individual who comes to us for general, restorative, and cosmetic dentistry. Dr. Bunday wants to ensure that you have a lifetime of oral health excellence! When you bring in your children for their general dentistry appointments, Dr. Bunday may recommend special tooth decay protection. Dental sealants, thin plastic layers painted on back molars, and fluoride supplements, gels applied to teeth to safeguard against cavities. The best way to ensure that you have a good general dentistry appointment is to maintain a daily oral hygiene routine that includes brushing, flossing, and rinsing with fluoridated products. We’ll capture digital photos and x-rays that will be used to assess areas of concern, and allow you to see your smile from our perspective, making you a more active participant in treatment planning. We’ll examine your smile visually and tactically looking for signs of common oral health concerns like tooth decay, gum disease, temporomandibular joint (TMJ) dysfunction, teeth grinding and clenching (bruxism), and oral cancer. Our skilled hygienist will carefully remove plaque and tartar from even the hardest to access parts of your smile. Dr. Bunday will sit down with you one on one to discuss your treatment options, and work with you to develop a plant that fits your needs, budget, and lifestyle. To protect teeth from decay-causing bacteria, dental sealants are a quick, painless, long lasting solution. As the name suggests, sealants create a coating over teeth that seals out bacteria, plaque, and tartar that can weaken tooth enamel. This is a fast, simple way to protect your teeth from decay or wear. With just one quick application as part of your regular six month checkup, dental sealants can protect your smile for years. The process is simple. We apply the liquid sealant to the surfaces of teeth and use a curing light to harden them in position. Once in place, dental sealants are completely clear. We often recommend sealants for younger patients who are still developing their oral hygiene routines. However, adults who are prone to decay and those who have teeth with hard to clean deep pits and grooves may also benefit from dental sealants. Temporomandibular joint (TMJ) dysfunction and bruxism may have a variety of causes that are unrelated, but they can both be treated with the same simple solution – oral appliance therapy. Known as occlusal guards, these appliances are custom crafted to move the jaw into a comfortable resting position relieving strain that can lead to TMJ dysfunction. Additionally, occlusal guards place a physical barrier between the rows of teeth in order to prevent unconscious wear and tear caused by teeth grinding and clenching. If you engage in sports where your smile may come in contact with other players, sports equipment, or hard surfaces, it’s important that you wear a mouthguard each time you practice or engage in these sports. Store bought sportsguards are available, but some patients find them uncomfortable. 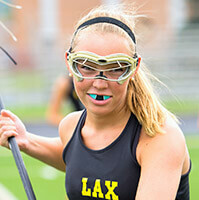 Custom sportsguards from our office offer both improved comfort and more effective results. If you engage in high impact sports or even lower impact sports like horse riding, swimming, or biking where your smile may be damaged, wearing a sportsguard every time you play is essential to protecting your teeth. While the majority of patients who suffer from oral cancer use tobacco, this is not the only high risk behavior associated with the disease, and more than 25% of patients diagnosed with oral cancer engage in none of these high risk behaviors. That’s why we include oral cancer screenings as part of every six month dental checkup. 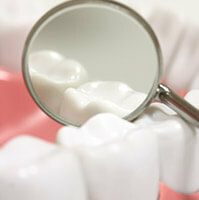 Oral cancer screenings are quick and completely painless. In fact, you may not even notice we’re conducting an oral cancer screening. We examine your smile visually and tactilely for warning signs of oral cancer including lumps, inflammation, discoloration, and other early indicators of this disease. If you notice any of these signs or have chronic sore throat or raspy voice, you may be suffering from oral cancer. Let us know right away, so we can begin diagnosis and treatment planning. We are happy to welcome patients of all ages to our Plano, TX practice, and that includes caring for your children’s smiles. We are happy to offer a number of treatments that are uniquely geared toward improving your child’s oral health from the eruption of their first primary tooth to the very last adult tooth. Most importantly, our dentist and team have years of experience working with kids to accommodate their unique behavioral and oral health care needs. We work hard to make your child feel completely comfortable throughout their time in our office. We want to create positive associations with the dentist that will encourage your child to maintain their healthiest smiles at every age. 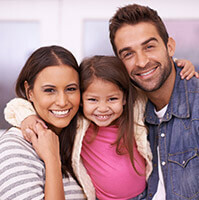 We also offer block scheduling for the whole family to make your child’s dental care more convenient. Periodontal disease, often referred to as gum disease, is a common oral health condition, affecting more than 50% of US adults. While in the early stages, known as gingivitis, the side effects are relatively mild. You may notice some bleeding when you brush or floss and mild irritation or inflammation, but most patients do not notice a significant change in oral health until it reaches the more severe stage, periodontitis. If we diagnose gum disease early enough, we may be able to get your oral health back on track with more frequent teeth cleanings. However, if we begin treatment at the periodontitis stages, we’ll need to incorporate more advanced restorative procedures such as scaling and root planing. Scaling is the systematic removal of plaque, tartar, and damaged tissue. Root planing is the smoothing of tooth roots to prevent the buildup of plaque and tartar in the future.